Diana Pharaoh Francis | Diana P. Francis | Diana Francis » Blog Archive » Surprise giveaway! 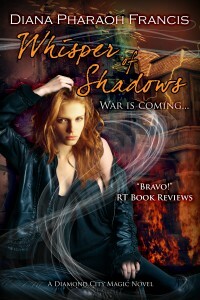 In honor of the release of Whisper of Shadows in two days (April 22), I want to give away 4 e-copies of The Incubus Job. All you’ve got to do is leave a comment in this post. And a way for me to contact you later. Or make sure you check back. You’ve got until Monday, April 25, noon, Pacific Standard Time. If you feel like it, tell me something about yourself in your comment. I’d love to know you better. Good luck! This entry was posted on Wednesday, April 20th, 2016 at 8:52 pm in Diamond City Magic, Job books, Promo. Tagged: Diamond City Magic, give away, giveaway, incubus job, Promo, Whisper of Shadows, win. You can feed this entry. Both comments and pings are currently closed. I would love to read more of your books! Greeting from (soon to be scorching hot) Las Vegas. Something about me? I read mostly SFF when I read for pleasure, but I don’t have enough time to read everything I want to. Confession: I haven’t read any of your fiction yet, although I would like to. I tweet as @mangoheroics (if you want to find out more about one side of me). Best wishes on the release of Whisper of Shadows. I’m really looking forward to reading it. 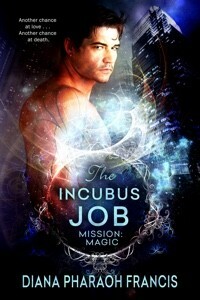 The Incubus Job sounds like a great read and I’d love to win a copy. As for me, my two great loves are reading and traveling. I’ve been to most of the states and about 25 countries, but still have plenty of places on “the list”. My hubs bought my first e-reader in 2003 so that he wouldn’t have to keep lifting luggage that was weighed down by books every time we went on a trip. I thoroughly enjoy reading your books. The Diamond City series is off to a great start. I’ve enjoyed your books since I picked up the first of the Path books. I’m a teacher in Northern Canada and a bit of a book hoarder. Your books have moved with me more then once at this point. I read a bit of everything but mostly fantasy, romance, science fiction, historical fiction, historical non-fiction and a lot of education related articles/books. Congratulations on your new release and thank you for the giveaway! The Horngate Witches books are some of my favorite books and Max is a heroine I’d want on my side! I haven’t bought this one yet, maybe because there is a chance I could win it? Yeah! If Amazon allows I will be downloading this book at 12:00 am Friday. It has been ordered but sometimes auto delivery can be a few hours late. I love your books and I have chickens. congrats on the upcoming release! Love your books and this series sounds awesome! Ummm… I originally only got a kinde so I could hide my compulsive book buying better. So while I still have a massive paperback collection, my kindle library is…. giant 🙂 thanks for sharing!